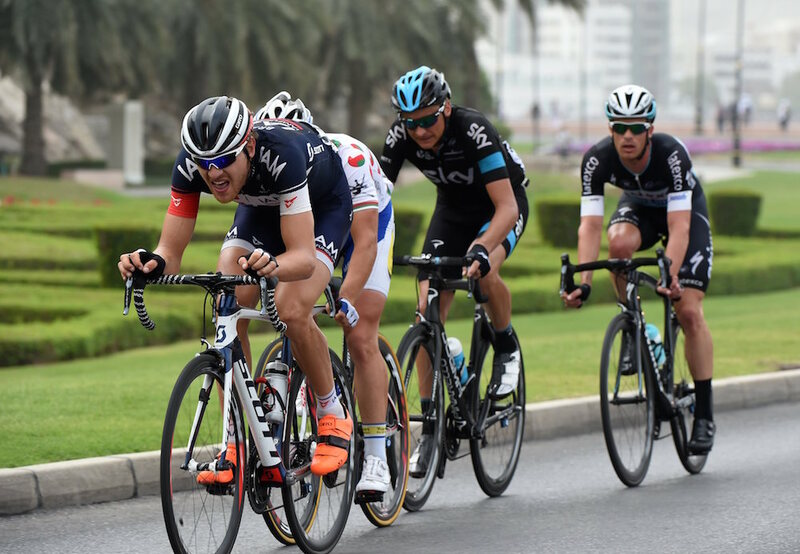 Matthias Brändle (IAM Cycling) won the final stage of the 2015 Tour of Oman, riding away from his three fellow escapees to cross the line six seconds ahead. No rider in the break was in a threatening position in the GC, meaning Rafael Valls (Lampre-Merida) wins the overall. Brändle attacked inside the finale and none of his breakaway companions were able to follow, with Iljo Keisse (Etixx-Quick Step) having to make do with second. Along with Brandle and Kiesse, Danny Pate (Sky) and Jef Van Meirhaeghe (Topsport Vlaanderen) all attacked early on the stage to make it into the day’s break. The peloton did not seem intent on chasing them down, allowing a gap of over nine minutes to materialise before starting the chase in earnest. Closing it proved too big a task for the peloton, and by the time only fifteen kilometres remained, the gap stood at around three and a half minutes and the break seemed certain to survive to the finish. Behind them, Peter Sagan (Tinkoff-Saxo) won the sprint for fifth place, and may in hindsight rue allowing the break to survive. There was some action in the GC as third place overall Alejandro Valverde (Movistar) put in a tentative attack on the final lap, but the terrain was not difficult enough to aid such efforts, meaning Valls hung on comfortably to seal the overall win. For the Spaniard it is a first ever overall win, and by far the best result in his career. It will be interesting to see how he manages to compete with the big names as the season progresses.